At least 12 people were killed in the Somali capital on Nov. 1 after Shebab gunmen used a vehicle packed with explosives to blast their way inside a hotel, police said. The Al-Qaeda linked Shebab claimed responsibility for the dawn attack at the Sahafi hotel, which is popular with members of parliament, government employees and businessmen. 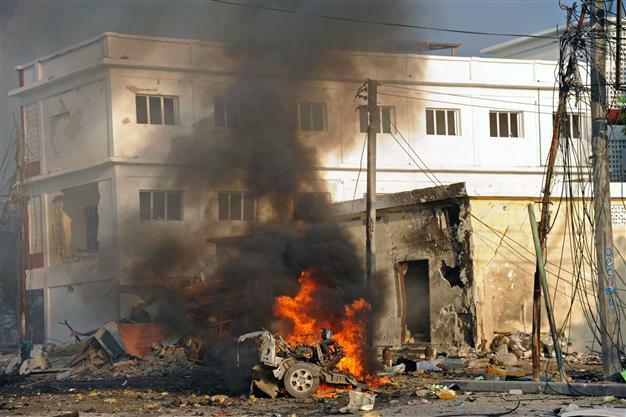 Somalia’s National and Intelligence Agency declared the attack over several hours after shooting began, although special forces appeared to be carrying out mopping up operations with the Shebab still claiming to have fighters alive inside. “It’s now completely secured,” the security agency said in a statement, without giving details of casualties. African Union soldiers, battling alongside government troops, also said they had taken control of the building. “Attackers exploded a car bomb to gain entry before going inside… we have reports of 12 dead,” policeman Abdulrahid Dahir said. Among the dead are reported to be a Somali journalist, colleagues said, as well as a former senior army commander. UN envoy to Somalia, Nick Kay, condemned the “bloody attack” which he said underlined the need to help support Somalia’s security forces in stopping such attacks. Witnesses said they had seen several bodies of people killed in the initial blast, when a minibus packed with explosives was reportedly used to ram the gates of the hotel’s fortified compound, which was followed by a second heavy explosion. Shebab commandos then stormed inside, with witnesses reporting intense gunfire and several loud blasts. “There was a huge explosion and people around the entrance were killed,” said Mohamed Ismael, a witness, who was nearby when the attack began. Shebab insurgents, who are fighting to overthrow the internationally backed government in Mogadishu, have carried out a string of attacks on hotels in the capital. The Islamists have frequently used car bombs driven by suicide bombers to break into a complex or a building, with more attackers then following on foot. Like other international hotels in Mogadishu, the Sahafi is heavily fortified. It was the site of the kidnapping of two French security agents in 2009, one of whom later escaped while the other was killed by the Shebab during a failed rescue attempt in 2013. Shebab spokesman Abdulaziz Abu Musab claimed the gunmen had overrun the hotel, which is situated near the major K4 roundabout. “The mujahedeen fighters took control of the Sahafi hotel, where apostates and invading Christians were staying,” he said in a statement. But the African Union mission in Somalia, AMISOM, a 22,000-strong force fighting the Shebab, said they fought alongside government troops and had secured the hotel. “Somalia government forces and AMISOM have taken control,” the AU force said in a brief statement. Shebab attacks seek to counter claims that they are close to defeat after losing territory, as well as regular US drone strikes against their leaders. The militants have also carried out a string of revenge strikes in neighbouring countries. This week, Somalia President Hassan Sheikh Mohamud called on Shebab fighters to surrender amid reports some factions may have shifted allegiance from Al-Qaeda to the Islamic State group. Mohamud said the reported divisions were “symptomatic of a group that has lost its way”, and warned that Somalis “do not need a new brand of horror and repression”.